On a Monday morning, Harris' powerful voice fills the small church right next to the Albany Civil Rights Institute in Georgia. She's showing them how she and her fellow Freedom Singers — a renowned quartet that raised money for student activists during the civil rights movement — belted out songs to get through dangerous protests. A muscular version of "This Little Light of Mine" is the emotional high point of Harris' presentation: a unifying affirmation that gives the crowd a taste of that feeling from the 1960s. She says the song helped steady protestors' nerves as abusive police officers threatened to beat them or worse. "Music was an anchor. It kept us from being afraid," Harris says. "You start singing a song, and somehow, those billy clubs would not hit you. It played a very important role in the movement." Fans know "This Little Light of Mine" as a beloved children's tune, recognized around the world. But it's also a spiritual, which was transformed by the nation's civil rights movement into an anthem of singular power. And the song has the same impact in today's times, where demonstrators still leverage its message to push back against injustice. Last year, Reverend Osagyefo Sekou used "This Little Light of Mine" to curb passions during a counter-protest, before a crowd of white supremacists and alt-right supporters gathered for the Unite the Right rally in Charlottesville, Va.
"We had originally said we were going to stand silently," says Rev. Sekou, a recording artist, author, theologian and activist who helped train volunteers at the counter-protest. "But the Nazis were marching past us in these various battalions, cursing and yelling — mostly homophobic slurs — at us. And you could feel the energy of the people who weren't with us, who we had not trained. [They] were getting amped up." Sekou says he knew, in that moment, he had to change the atmosphere. "I know song can do that. So I just broke into 'This Little Light of Mine.' "
In a moment captured on video, the clergy and volunteers who sang — a group that included famed academic and activist Cornel West — are shown standing in a line, their voices rising over the chants of "You will not replace us" from the rally crowd. "The tensions went down ... and it shook the Nazis," Sekou says. "They didn't know what to do with all that joy. We weren't going to let the darkness have the last word." It makes sense that a song with this much power would also be one of the most versatile anthems around, inspiring all kinds of musical artists. Rev. Sekou brought a different version of the song to NPR's Tiny Desk Concert series in July. Before that, Bruce Springsteen used it to take his audiences to church, playing a gospelized version during his tour with The Seeger Sessions Band. The Disney Channel built a 2012 movie around the song, called Let It Shine, that added rap. The tune even brought a little soul music to the last royal wedding, courtesy of British gospel artists Karen Gibson and the Kingdom Choir. Sometimes, experts say, such folk songs become spirituals over the years, sung everywhere from churches to prison work camps. That might explain a version of the song sung by Doris McMurray, an inmate at a Texas prison, recorded by folklorists John and Ruby Lomax in 1939. McMurray's tone is both plaintive and mournful as she sings without accompaniment, insisting that "In my neighbor's home, I'm gonna let it shine / Let it shine let it shine, let it shine." So who created "This Little Light of Mine"? Some books credit Harry Dixon Loes, a teacher and composer born in 1892 who edited at least a dozen hymnals and songbooks and wrote more than 3,000 songs, according to his 1965 obituary. But once the song was popular, it belonged to everyone. As the civil rights movement grew in the 1950s and '60s, singers changed the lyrics to reference their struggles. These new versions were known as "freedom songs." "They are simple melodies that can be sung by a small group or a large group," says Robert Darden, a gospel music historian and professor at Baylor University in Texas. "And the lyrics are composed in a way that the names of who they are protesting against can easily be inserted. They can be personalized and set to a place." Fannie Lou Hamer, Zilphia Horton and other legendary activists sang "freedom song" versions of "This Little Light of Mine" and passed them on for others to use. One place where a lot of this sharing occurred was the Highlander Folk School (now known as the Highlander Research and Education Center), a cultural center in Tennessee where activists including Rosa Parks, Pete Seeger and Martin Luther King Jr. gathered to trade ideas. Candie Carawan — who worked with her late husband Guy, Highlander's former music director — says songs like "This Little Light of Mine" could be nonviolent weapons. "It's a way to speak to power in way that's not going to get you shot," Carawan says with a chuckle. "It's a way to say, 'This is what we think. This is what we feel.' But, you know, you're singing it." "Some of my favorite spirituals are the ones that have an implied defiance to them," Robert Darden adds. It might seem odd to call such an innocent-sounding song defiant. But that's exactly how blues singer Bettie Mae Fikes says she felt when creating her classic version of "This Little Light of Mine" in 1963. She improvised the lyrics after a protest in which several of her friends had been attacked. "And I'm thinking, 'How is the light [going to] shine, when they're trying to put our lights out?'" Fikes says. "So everybody was taking verses — and in order to come in, I just went into the slave call." The result was a long, melismatic vocal run that turned into verses where she named specific officials — such as the former sheriff of Selma, Ala."I just started adding our oppressors in the song: 'Tell Jim Clark, I'm gonna let it shine,' " Fikes says. "And as I added my oppressors, other people in the audience began to shout out: 'Tell the KKK!' "Tell our president!' It was like being free." Fast forward a half-century and the song is still unifying people. Consider the Christian electronic dance music band LZ7, which had a hit single in 2010 with an amped-up version of the song, inspired a bit by the Black Eyed Peas' "Where Is the Love?" Frontman Lindz West says the track is an attempt to inspire youth who won't necessarily respond to a traditional spiritual or hymn. "I love the old hymns. I love 'Amazing Grace.' But how does that connect to a 12-year-old kid in inner-city London?" he says. "This is written for the kids that would never step into a church, but they'd step into a club with us and have a dance." West says the group has performed its version of "This Little Light of Mine" before thousands of fans across the world. For him, it's an anthem because it sticks in people's heads — including his own during recording, he notes with a laugh — but also because it inspires, something West sees when he visits schools in Britain. "Anthems are uplifting and game-changing, and they set standards. Something like 'This Little Light' is just that," he says. "What makes it anthemic is, you see lives transformed. You see kids saying, 'I'm not giving up on life,' or, 'I'm not cutting anymore.'" Still, a question persists: Why has "This Little Light of Mine" survived so long, in so many different settings? Robert Darden, who has written about the song in at least two books, has a theory. "Ask some of the survivors of the civil rights movement, as I have — survivors who sang these songs for protection and for courage — why 'This Little Light of Mine' survives and is still sung in the #MeToo movement and women's movement," he says. "They look at me straight in the eye and they say, 'It is because those songs are anointed.' As an academic, I have no way to refute that. Nor do I want to." Whether or not you believe the song is blessed, it's obvious this American anthem sparks a powerful feeling, which has made so many who sing it feel a little less alone and a little more free. That probably explains the enduring power of "This Little Light of Mine" better than any other reason. You might recognize this song. UNIDENTIFIED CHILDREN: (Singing) This little light of mine, I'm going to let it shine. SHAPIRO: "This Little Light Of Mine" is a beloved children's song that became a civil rights anthem. As part of NPR's American Anthem series, critic Eric Deggans looks at the influence of the song. RUTHA MAE HARRIS: (Singing) Oh, this little light. ERIC DEGGANS, BYLINE: Ask Freedom Singer Rutha Mae Harris, and she'll answer plainly. You can't just sing "This Little Light Of Mine." You've got to shout it. HARRIS: (Singing) Everywhere I go, Lord. DEGGANS: Harris is facing a tour group at a small church next to the Albany Civil Rights Institute in Georgia, showing them how she and her fellow Freedom Singers belted out songs to get through protests in the early 1960s. "This Little Light Of Mine" helped steady their nerves as abusive police officers with billy clubs threatened to beat them or worse. HARRIS: It kept us from being afraid. We'd start singing the song, and somehow those billy clubs would not hit you. It played a very important role during the movement. HARRIS: (Singing) I've got the light of freedom. UNIDENTIFIED SINGERS #1: (Singing) I'm going to let it shine. DEGGANS: Harris' voice gives the crowd a taste of that feeling from the 1960s. It's a unifying affirmation that's contagious. And the song has the same impact in today's times, where demonstrators still leverage its power to push back against injustice. 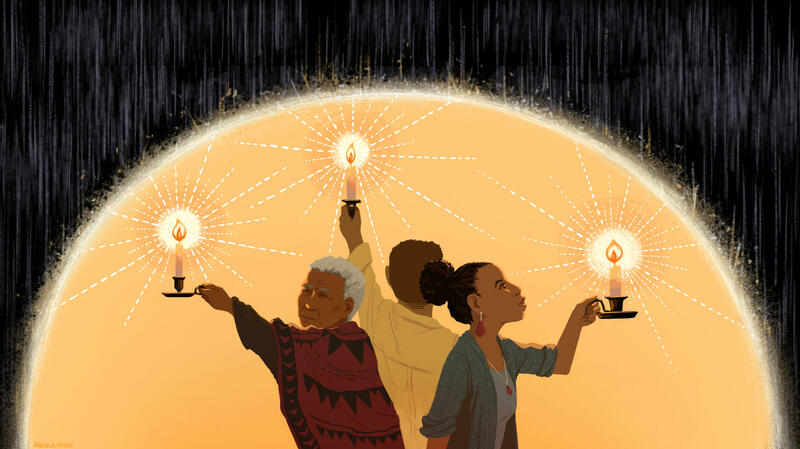 Last year, Reverend Osagyefo Uhuru Sekou used "This Little Light Of Mine" to curb passions during a counterprotest before a crowd of white supremacists and alt-right supporters in Charlottesville, Va. UNIDENTIFIED PERSON #1: Can you guys sing? DEGGANS: The group of clergy and volunteers who sang, including academic Cornel West, were captured in a YouTube video. You can hear chants from alt-right supporters yelling, you will not replace us. UNIDENTIFIED CROWD #1: You will not replace us. You will not replace us. DEGGANS: Leading the singing was Reverend Sekou, a recording artist and activist. OSAGYEFO UHURU SEKOU: Well, we had originally said we were going to stand silently. But the Nazis were marching past us cursing and yelling mostly homophobic slurs at us. And I do know that, you know, Pentecostals - we talk about changing the atmosphere. And so I know song could do that. So I just broke out in "This Little Light Of Mine." UNIDENTIFIED PERSON #2: (Singing) It's all I feel. UNIDENTIFIED CROWD #2: (Singing) I'm going to let it shine. SEKOU: And it shook the Nazis. They didn't know what to do with that joy. We weren't going to let the darkness have the last word. DEGGANS: It makes sense that a song with this much power would also be one of the most versatile anthems around, inspiring all kinds of musical artists. Bruce Springsteen used "This Little Light Of Mine" to take audiences to church on his tour with The Seeger Sessions Band. DEGGANS: The Disney Channel built a 2012 movie around the song called "Let It Shine" that added rap. TYLER JAMES WILLIAMS: (Rapping) And belief is the key, so open up your heart and let your life free. UNIDENTIFIED SINGERS #2: (Singing) This little light of mine. DEGGANS: And it even brought a little soul music to the last royal wedding courtesy of British gospel artist Karen Gibson and The Kingdom Choir. KAREN GIBSON: (Singing) This little light of mine. THE KINGDOM CHOIR: (Singing) This little light of mine. GIBSON: (Singing) I'm going to let it shine. THE KINGDOM CHOIR: (Singing) I'm going to let it shine. DEGGANS: Sometimes, experts say, songs like "This Little Light Of Mine" start off as children's folk songs which become spirituals sung everywhere from churches to prison work camps. DORIS MCMURRAY: (Singing) Everywhere I go I'm going to let it shine. DEGGANS: Like this version sung by Texas prison inmate Doris McMurray recorded in 1939 by folklorists John and Ruby Lomax. MCMURRAY: (Singing) Everywhere I go I'm going to let it shine, let it shine, let it shine, let it shine. DEGGANS: So who created "This Little Light Of Mine"? Wikipedia and some books credit Harry Dixon Loes, a teacher and composer born in 1892 whose obituary says he wrote 3,000 songs and edited at least a dozen hymnals and songbooks. That would be an interesting cultural crosspollination - a white composer creating a song popular in black churches and credited in some books as an African-American spiritual. But researchers at Moody Bible Institute, where Loes taught for 21 years, say they found no evidence he wrote the song or claimed to write it. They note that he did create a popular arrangement of it in the 1940s performed here by noted gospel singer George Beverly Shea in 1948. GEORGE BEVERLY SHEA: (Singing) This little light of mine, I'm going to let it shine. This little light of mine, I'm going to let it shine, let it shine, let it shine, let it shine. DEGGANS: And once the song was popular, it belonged to everyone. As the civil rights movement grew in the 1950s and '60s, singers changed the lyrics to reference their struggles. These new versions were known as freedom songs. FANNIE LOU HAMER AND UNIDENTIFIED SINGERS: (Singing) Oh, I've got the light of freedom. I'm going to let it shine. Oh, I've got the light of freedom. I'm going to let it shine. DEGGANS: Activists like Fannie Lou Hamer, heard here, and Zilphia Horton sang freedom song versions of "This Little Light Of Mine" and taught it to others. One place where a lot of this sharing occurred was the Highlander Folk School, a cultural center in Tennessee where activists like Rosa Parks, Pete Seeger and Martin Luther King Jr. gathered to trade ideas. Candie Carawan, who worked with her late husband Guy, Highlander's music director and song leader, said songs like "This Little Light Of Mine" could be nonviolent weapons. CANDIE CARAWAN: You know, it's a way to speak to power in a way that is not going to get you shot, kind of a nonviolent tool. It's a way to say, this is what we think; this is what we feel. But, you know, you're singing it. DEGGANS: It might seem odd to call such an innocent-sounding song defiant, but that's exactly how blues singer Bettie Mae Fikes felt when she created her classic version of "This Little Light Of Mine" in 1963. She improvised the lyrics after a protest in which several of her friends had been attacked. BETTIE MAE FIKES: And I'm thinking, you know, how is the light shine when they're trying to put all the lights out? So everybody was taking verses. And in order to come in, I just went into the slave call. (Singing) Whoa. UNIDENTIFIED SINGERS #3: (Singing) I'm going to let it shine. FIKES: And all of a sudden, I just started adding our oppressors in the song - tell Jim Clark I'm going to let it shine. FIKES: (Singing) Tell Jim Clark. And as I added my oppressors, here other people in the audience began to shout out, tell the KKK; tell our president. It was like being free. DEGGANS: Still, one question persists. Why has "This Little Light Of Mine" survived for so long? Robert Darden, a professor at Baylor University who's written about the song in at least two books, has a theory. ROBERT DARDEN: If you've asked some of the survivors of the civil rights movement as I did, survivors who sang these songs for protection and for courage why "This Little Light Of Mine" survives and is still sung, they would look at me straight in the eye and say, because those songs are anointed. And as an academic, I have no way to refute that, nor do I want to. DEGGANS: It's obvious this American anthem sparks a feeling which made so many who sing it feel a little less alone and a little more free, which probably explains the enduring power of "This Little Light Of Mine" better than any other reason. UNIDENTIFIED SINGER: (Singing) This little light of mine. DEGGANS: Eric Deggans, NPR News. Transcript provided by NPR, Copyright NPR.